Trying to describe the Seven is like trying to describe a flower or snow flake. No two cars are alike. They have evolved during their forty year history. They take on the character of the owner, and each owner leaves their mark. Each one is different. They all look similar. However each owner will make some modification, either because the use of the car is slightly different or because the original parts are no longer available. In general, you can look at the mechanical history and see how the design progressed. Wheel base is 88.5 inches, front track is 48.4, overall length is 133, width is 62.2, and height is 44. 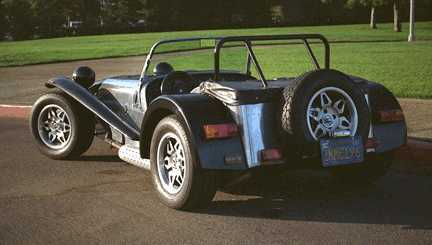 The Caterham JPE Super Seven set the world record for fastest zero to sixty acceleration at 3.48 seconds. This record for a production car was previously held by a Ferrari F40. Fast Lane magazine in England set the record and described the effort in the May 1993 issue. Nice for a design almost thirty years old. And it goes around corners as well. There were a variety of power plants, from the 948 Austin America engine to the record setting 2.0 Vauxhall with 250 horse power. Because this was a component car, a variety of engines were used and you might find anything under the hood. Most common is the 1600 Kent block with dual 40DCOE Weber carburetors, headers, and a mild sprint cam. This produces 100 horse power reliably. The suspension is also minimalist with lightness guiding the design. The front A arm suspension combines the forward part of the upper A arm with the sway bar, as the arm goes to the forward bulkhead, crosses over to the other side of the car, and ends as the forward part of the upper A arm on the other side. There is no camber adjustment in the original design as Colin Chapman did not believe the owner could get this right. The weight distribution is almost perfect, being evenly distributed front and rear. With a little jacking, even with the driver on one side of the car, the weight of one corner is within five pounds of any other. The car can be considered a mid-engined car with the engine located truly behind the front axle. The rear axle is located by a single trailing arm on either side. The lateral location is by an A frame, with the legs attached to the frame forward and the top part of the A attached to the bottom of the differential carrier. This makes for an extremely low roll center. The axle is from a Triumph Marina (TR 10) and is reinforced against twist by a steel plate running all the way from one wheel across to the other. Brakes are disc in the front and drum in the rear. There is no balance bar in the original. The transmission is a four speed and requires a remote shift lever because the cockpit is farther back than the original. The interior is spartan. There is only a cushion on the floor for each passenger and a flat upholstered board across the back for a back rest. The side of the car and transmission tunnel provide a narrow space to sit and locate the driver laterally. The controls are all located normally. The pedals are in a normal position but there is little room for your feet, especially if your feet are larger than ten inches. There is no dead pedal but there is a screw in the approximate position to catch the side of your sole. Full weather gear is available, with a top and side curtains. The Roll bar helps support the top and it is a real challenge to enter the car with passenger as the opening is very small. The current generation Caterham has the following differences. The cockpit has been extended and now allows for an adjustable seat. The engine is the 1700 Vauxhall, producing 125 horsepower. The rear axle is now an independent de Dion from the Ford Sierra and has disc rear brakes. Performance continues to increase as engine technology advances. The specification of the car during the time I owned mine was shown in a flyer.